The Hawaii eviction notice forms are for use by a landlord when the landlord seeks to have the tenant vacate the rented property due to failure to pay rent, failure to abide by the terms of the lease or because the term of the tenancy is coming to an end. If the tenant fails to respond to the notice to quit, the landlord may file a Complaint (See Sample) and Summons (See Sample) in the Local District Court. 5-Day Notice to Quit (Non-Payment of Rent) – The landlord may use this notice at any time after the rental payment due date. The tenant has five days to pay the rent before landlord may begin eviction proceedings. 5-Day Notice to Quit (Nuisance) – The landlord may use this form at any time after tenant has created a nuisance in or around the premises. A nuisance is defined under Section 712-1270. 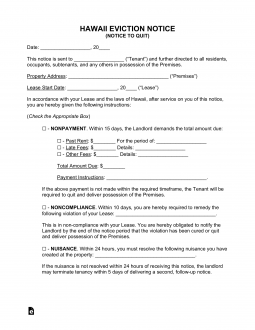 10-Day Notice to Quit (Non-Compliance) – The landlord may use this form if tenant is in breach of a provision of the lease (other than non-payment of rent). The tenant has ten days to rectify the problem before landlord may begin eviction proceedings. Terminate Month to Month Tenancy Letter (28/45 Day Notice) – The landlord or tenant may use to terminate their tenancy at will. Landlords are required to give at least forty-five (45) days’ notice while tenants only have to give twenty-eight (28) days. Rent is late when tenant fails to pay by the due date set forth in the lease. A landlord may provide a notice to the tenant that the rent is late and if the rent is not paid within 5 days of that notice, landlord may begin eviction proceedings. Step 2 – If the tenant fails to respond to the notice provided by the landlord, landlord may begin evictions proceedings (called summary process) by filing a complaint and summons with the district court in the county in which the property is located. The fee for filing is $155.00 and you must attach a copy of the lease and notice that was sent to the tenant. Each court has its own form of complaint and summons which you may access by going to This Site. Step 3 – The Summons and Complaint must be served on tenant by a process server licensed in the State of Hawaii. Tenant will have a certain amount of time to respond – either five days after receipt or by a date specified by the court. Step 4 – If the tenant does not respond, the court will issue a Writ of Possession and the landlord may obtain the services of a sheriff to have the tenant and the tenant’s possessions removed. The Hawaii Notice To Quit may be easily obtained on this page by clicking on one of the buttons labeled “PDF,” “ODT,” and “Word.” It is strongly recommended to be familiar with the Lease and to have it on hand before filling out this form. The Location of the Leased Property this Notification addresses will need to be reported in the first statement with blank spaces. These blank spaces will require the City, County, State, Building Number/Street Name, and Apartment Number of the Property concerning the Notification Statement on this document. The second statement containing blank spaces will call for the components making up the Signature Date reported on the Lease. Each space must have the appropriate part of this Date recorded on it. Enter them in this order: Calendar Date, Month, and Year. This document provides the option of selecting one of several Notifications that may be issued to the Recipient listed above. The Preparer of this form will need to select the appropriate statement by marking the checkbox it corresponds to. Information specific to the situation will be called for in whichever statement you select. The first option will be the “Nonpayment” Notification. Select this box if you need to issue a Notice to the Tenant that he or she has Five Days to pay a Past Due Rent or submit possession of the Leased Property to the Landlord. You may name an alternate Authorized Agent to accept the Past Due Rent but must Name this entity on the blank space provided. Similarly, you must define the Total Sum owed by the Tenant, the Rent Amount the Tenant must pay to remain, and the Time Period this amount will apply to. The second option will be the “Noncompliance” Notification. Select this box if you must issue a Notice to a Recipient who will be given Ten Days to repair a violation regarding the Rental Agreement or leave the premises so the Landlord can re-assume possession. Document the violation on the blank line in this statement. The third option will be the “Nuisance” Notification. Select this box if a Tenant must be informed he or she must relinquish and deliver possession of the Leased Property to the Landlord in Five Days due to violating Hawaii Statutes Section 712-1270 and is considered a Nuisance. Document the Nuisance observed on the blank space in this section. The fourth option will be the “Month To Month Tenancy” Notification from a Landlord statement. Select this box if to notify a Tenant that his or her Month To Month Tenancy Contract will be terminated (at least) Forty-Five Days from the next Rent Due Date. The Last Calendar Date the Monthly Lease is active must be reported utilizing the blank spaces in this section. The fifth option will be the “Month To Month Tenancy” Notification from a Tenant statement. Select this box if the Landlord must be informed, through this Notice, that his or her Tenant will end the Month To Month Tenancy Contract held on the Date you enter using the blank spaces. Make sure this Date is at least Forty-Five Days from the next time the Rent is due. The Landlord or Agent who issues this Notice must make sure the Recipient will take it seriously and that compliance is mandatory. Locate the paragraph being introduced using the bold phrase “You Are Further Notified That…” If you are a Landlord or Agent of the Landlord, issuing this Notice, then Sign your Name on the blank line provided at the end of this paragraph. The “Certificate of Delivery” section will conclude this document. The information in this area may only be supplied at, or after, Delivery has been affected and must be filled in by the Delivery Agent. It will call for the Date of Delivery, the Recipient’s Full Name, a definition of how the Delivery was completed, and the Agent Signature. Use the blank spaces in the first sentence to fill in the Calendar Date of the Delivery and the complete Name of the Recipient. Check one of the three statements at the end of this section to indicate this document’s Delivery as either completed by handing it to the intended Recipient, completed by handing this document to an adult second party who can be trusted to complete the delivery, or if it was mailed using First Class Mail. After selecting one of these statements, Sign your Name (as the Delivery Agent) to verify the information reported in this section is true.